A new O.C. Tanner poll found that one-third of respondents admitted calling in sick when they weren't ill to get out of work. And of those who faked an out-sick call, January was the most popular month for call-ins. Respondents said the top excuses for staying out are rest, relaxation or the need to spend time with their families. Survey results suggested, however, that an underlying cause for their playing hooky was their dissatisfaction with their organizations. The survey also found that most respondents don't call in sick often — 68% call in less than once a year and 12% call in once a year. More than one-third of respondents who have called in sick agreed that their work situation keeps them from being happy in other areas of their lives and 40% of those who called in sick said they don't trust their senior leaders. Slightly more from the same group agreed that their organization cares more about bottom lines and productivity than people. O.C. Tanner recommended that, as the new year begins, employers should think about using this time of the year to assess team satisfaction and be sensitive to employees' frustrations and the potential for burnout. The O.C. Tanner poll may have found that employees' faking sick doesn't happen often, but that doesn't mean employers should ignore the phenomenon entirely. Employers can intervene by regularly gauging workers' satisfaction through internal polling. Hidden dissatisfaction among workers could turn into chronic absenteeism, which, in turn, can lower productivity and lead to burnout. When managers suspect their employees are burned out, they may want to adjust employees' workloads, encourage them to take their allotted vacation time or refer them to employee assistance programs. It might be hard to determine when employees are being truthful when calling in sick, especially if it occurs infrequently. For example, illness might be weariness; 74% of respondents in an Accountemps poll come to work tired. Offering sufficient paid time off, flexible work schedules and remote-work options might allow employees to get the rest and relaxation they need to supply them with energy for work. When employers allow dissatisfaction to fester, it can spread, creating a toxic work environment. In a recent poll, negative people were rated as the worst kind of coworker, one who often forces others to quit their jobs. Organizations should listen and respond to workers' complaints immediately and create a workspace in which employees feel heard and valued. Seattle, WA – January 9, 2019 – Today, PayScale Inc, the leader in precise, on-demand cloud compensation data and software for businesses and individuals, released the Q4 2018 PayScale Index, which tracks quarterly and annual trends in compensation and provides a U.S. wage forecast for the coming quarter. The most recent Q4 Index revealed nominal wages grew 1.1 percent since Q3 and 1.0 percent year over year. However, the modest uptick in nominal wages failed to bring real wages out of the red for the year. As a result, real wages fell by 1.3 percent since the end of 2017 which means the average person can purchase less than they could last year when wages are measured in relation to inflation. The largest annual wage losses occurred in transportation and manufacturing which fell 3.9 percent and 2.4 percent since the end of 2017, respectively. In addition, the Energy & Utilities, Construction, and Transportation & Warehousing industries all experienced a decline in annual wages. The technology sector topped the list of growth by industry with wages up 2.7 percent over the past year. Meanwhile, marketing and advertising jobs continued to post impressive wage growth in Q4 with an increase of 5.5 percent over Q4 2017. In addition, the Real Estate and Finance & Insurance industries also experienced wage growth with both sectors experiencing year-over-year wage growth of 2.4 percent. San Francisco again experienced the largest increase in wages with 4.9 percent increase since last year. San Jose and San Diego also topped the list of metros with annual wage growth of 3.3 percent and 3.0 percent, respectively. Nationally, wages in Canada grew by 1.9 percent over the past year. Vancouver topped the Canadian list of metros with increased annual wage growth of 3.2 percent in Vancouver while the oil city of Calgary experienced the slowest wage growth of just 0.6 percent in 2018. The PayScale Index is a different economic measure than the Employment Cost Index (ECI) reported by the Bureau of Labor Statistics (BLS). While the ECI tracks employment costs within organizations, the PayScale Index tracks workers’ wages across various organizations. This means the PayScale Index will capture changes in employees’ wages when they move to a different company, while the ECI does not. There is value in using both the ECI and the PayScale Index to determine relative wage growth in the U.S. economy. PayScale offers modern compensation software and the most precise, real-time, data-driven insights for employees and employers alike. More than 7,000 customers, from small businesses to Fortune 500 companies, use PayScale to power pay decisions for more than 18 million employees. These companies include Dish Network, Getty Images, Skullcandy, Time Warner, T-Mobile, Macy’s, Sunsweet, UnitedHealth Group, Stihl and Wendy’s. For more information, please visit: www.payscale.com or follow PayScale on Twitter: https://twitter.com/payscale. Refinement of ISS Review of Board Actions in Response to a Low Say-on-Pay Vote. Generally, when a say-on-pay proposal receives less than 70% support of votes cast (for and against), ISS will conduct a qualitative review of the compensation committee’s responsiveness to the low support at the next annual meeting. ISS has refined its policy to add that in cases of low support in connection with an unusual situation, such as a proxy contest or bankruptcy, ISS will review how the board considered investor dissent and whether the board took actions to meaningfully respond. Quantitative Pay-for-Performance Screens Remain Unchanged. While the quantitative screens remain unchanged for the 2019 proxy season, ISS will continue to explore Economic Value Added (EVA) metrics to round out the market performance (TSR) and accounting performance (GAAP) measures utilized in ISS’s financial performance analysis. EVA data will be displayed in ISS research reports on a phased-in basis, but will not impact ISS’s quantitative pay-for-performance analysis at this time. Neutral View of TSR as an Incentive Program Metric. ISS does not endorse or prefer TSR or any specific metric in executive incentive programs, although ISS recognizes that investors prefer programs that emphasize objective and transparent metrics. ISS believes that boards and compensation committees are generally in the best position to determine the incentive plan metrics that encourage executive decision-making that promotes long-term shareholder value creation. Refinement of Qualitative Pay-for-Performance Analysis. In addition to the key factors that ISS will consider in performing its qualitative pay-for-performance analysis, ISS will look for an emphasis on objective and transparent performance metrics, and it will also look at the actual results of financial and operational metrics, including any non-standard adjustments to such results. Scrutiny of Front-Loaded Awards. It is unlikely that ISS will support front-loaded equity awards that are intended to cover more than four years, due to ISS’s concern that such awards limit a board’s ability to meaningfully adjust future pay opportunities in response to changes in performance or strategic focus, or unforeseen events. ISS expects any front-loaded awards to include a firm commitment not to grant additional awards over the covered period. ISS will more closely scrutinize the pay-for-performance considerations for front-loaded awards, including, without limitation, completeness of disclosure, emphasis on transparent and rigorous performance criteria, and stringent vesting conditions that limit windfall risk. “Good Reason” definition triggered by a successor’s failure to assume a specific agreement as a problematic pay practice. New Problematic Pay Practices. ISS will consider shifts away from performance-based compensation to discretionary or fixed pay elements, such as changes made in response to the elimination of the Internal Revenue Code Section 162(m) performance-based compensation deduction that remove all performance-based criteria, as a problematic pay practice. In addition, insufficient executive compensation disclosure by externally managed issuers that prevents a reasonable assessment of the pay programs applicable to the executives of such issuers will likely result in a negative say-on-pay recommendation. Scaled Compensation Disclosure for Newly Qualified Smaller Reporting Companies. ISS may be unlikely to support a say-on-pay vote if a newly qualified smaller reporting company (SRC) avails itself of the scaled disclosure requirements and the scaled disclosure does not allow shareholders to meaningfully assess the board’s compensation philosophy and practices or enable investors to make an informed say-on-pay vote. As a result, SRCs may feel increased pressure to provide disclosure that exceeds what is required under the SEC’s scaled disclosure requirements in order to address concerns from ISS and Glass Lewis. 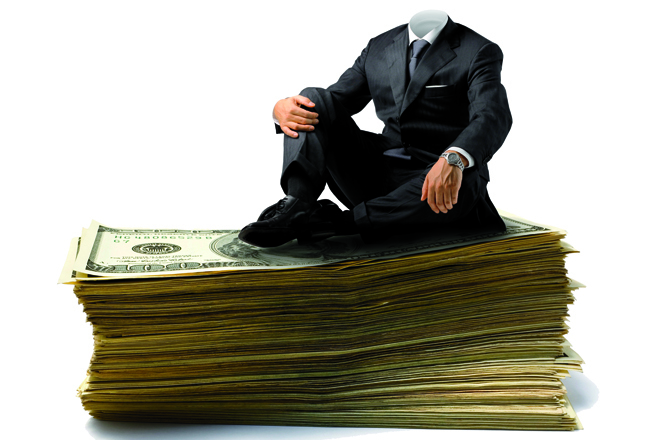 Excessive Non-Employee Director Compensation. ISS has delayed the implementation of its policy, initially scheduled to go into effect for the 2019 proxy season, to issue adverse voting recommendations for companies with excessive non-employee director (NED) pay without a compelling rationale. Instead, beginning in 2020, ISS will recommend withhold votes for board members responsible for setting and approving director compensation when there is a pattern of excessive NED pay for two or more consecutive years, absent a compelling rationale. Acceptable rationales, if reasonable and adequately explained, include (i) onboarding grants for new directors that are clearly identified as one-time in nature; (ii) special payments related to corporate transactions or special circumstances, e.g., special committee service; and (iii) payments made for specialized scientific expertise. ISS will assess payments in connection with separate consulting agreements on a case-by-case basis, and will not view payments to reward general performance or service as a compelling rationale. ISS’s revised methodology to identify NED outliers will focus on individual NED pay above the top 2-3% of all comparable directors within the same index and two-digit GICS group, recognizing that nonexecutive chairs and lead independent chairs, as board-level leaders, are often recognized with additional pay compared to other NEDs. ISS’s revised methodology also acknowledges that in certain sector and index groupings, NED pay is narrowly distributed, and for such groups where there is a very small difference in pay magnitude between the top 2-3% of directors and the median director, the narrow distribution of NED pay may be a mitigating factor. CEO Pay Ratio. ISS will continue to display a company’s disclosed median employee pay figure and the CEO pay ratio, compared to the prior year (as available), in ISS research reports. However, these data points will not impact ISS vote recommendations at this time. Liberal Change in Control Definition Combined with Single-Trigger Vesting. ISS will now view a liberal change in control (CIC) definition that could result in the vesting of awards by any trigger other than a full double trigger (i.e., a termination of employment in connection with a CIC) as a negative overriding factor, which may result in ISS’s recommendation against an equity plan proposal, regardless of the plan’s Equity Plan Scorecard (EPSC) score. Therefore, companies should take steps to update any liberal CIC definitions and single-trigger CIC vesting provisions contained in existing equity plans (if a share pool needs replenishment) or proposed new plans in light of ISS’s updated guidance. Updates to CIC Vesting Factor. ISS will assess the CIC vesting factor for its EPSC models to award points based on the quality of disclosure of CIC vesting provisions, rather than based on the actual vesting treatment of awards. Full points will be earned where the equity plan discloses with specificity the CIC vesting treatment for both performance- and time-based awards. If the plan is silent on the CIC vesting treatment or provides for discretionary vesting for either type of award, then no points will be earned. As a result, new equity plans or amendments to plans that require shareholder approval may need to “hard-wire” the CIC vesting treatment for performance- and time-based awards in order to receive full points. New EPSC “Negative Override” Factor. ISS announced a new negative override factor for excessive shareholder dilution under the S&P 500 and Russell 3000 EPSC models only. 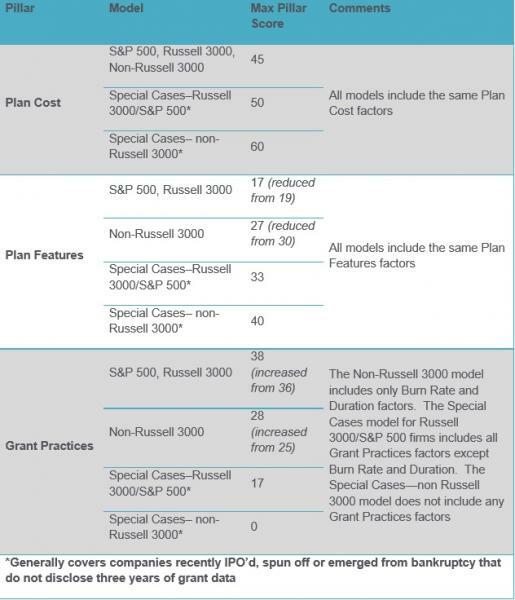 The new override will be triggered when a company’s equity plan is estimated to dilute shareholders by more than 20% (for the S&P 500 only) or 25% (for the Russell 3000 only). The override factor measures share capital dilution rather than voting power dilution, and is calculated as (A + B + C) ÷ CSO, where A = # new shares requested, B = # shares that remain available for issuance, C = # shares underlying unexercised/unvested outstanding awards, and CSO = common shares outstanding. No Changes to EPSC Passing Scores. Passing scores for all U.S. EPSC models have not changed from the 2018 proxy season (which remain 55 points for S&P 500 companies, and 53 points for all others), although companies should expect that, consistent with past practice, ISS will reallocate the points and weightings among some of the individual factors within each EPSC model. ISS has indicated that weighting on the plan duration factor has increased to encourage plan approval resubmission to shareholders more often than listing exchanges require, to counter the elimination of shareholder approval for Code Section 162(m) purposes. The chart below summarizes the maximum scores by EPSC models and pillars effective for shareholder meetings held on or after February 1, 2019. Elimination of Code Section 162(m) Performance-Based Compensation Deduction. The Tax Cuts and Jobs Act of 2017 eliminated the performance-based compensation deduction under Code Section 162(m), subject to a grandfather rule which allows a limited category of performance-based compensation to continue to be deductible. As a result, ISS had updated its guidance to allow for incentive plan amendments that remove general references to Code Section 162(m) qualification as administrative or neutral amendments. However, ISS may negatively view removal of incentive plan provisions that represent good governance practices, which were previously required to qualify performance-based compensation under Code Section 162(m), as negative changes when ISS evaluates plan amendments. Therefore, plan amendments to remove individual award limits and allow the plan administrator upward discretion in determining award amounts may be viewed negatively. Data from Randstad Sourceright's Talent Trends found that human capital and C-suite leaders feel generally optimistic about their organizations' future prospects. According to 800 global respondents in Randstad's 2019 Business Health Index, conditions have improved slightly for companies, kick-starting a trend of across-the-board hiring, fueled by a pro-business political atmosphere. The index gave each of 17 countries surveyed a single score based on a combination of four factors: 1) actual business growth against expectations; 2) levels of hiring; 3) the political environment's impact on business; and 4) future growth outlook. The data showed that a positive business attitude grew by 37% among respondents, and that hiring was extensive during the last 12 months, for a 90% increase. Some countries feel more positive than others, the data revealed. U.S. respondents went into 2019 optimistic, but are less confident than the year before. Meanwhile, U.K. and Canada's confidence rose by 64 and 49 points, respectively. The U.K., Germany, Australia and Japan had the highest 2019 index ranking, and the U.S., Mexico and Poland had the lowest. Although some economists and employment experts say another recession is possible, the hiring landscape currently remains positive. The labor market is still employee-driven; job growth continues in some industries, such as technology; and the current unemployment remains low, at 3.9%. Recruiters will likely experience the same challenges in 2019 as they did last year, as employees and job seekers have the upper hand in today's labor market. Employers must be ready to offer the types of benefits and perks they're seeking, or else they'll exercise their options with the competition. Although higher pay is still the biggest incentive for jumping ship, health and wellness programs, flexible work schedules, career development opportunities, meaningful work and paid family leave top the list of in-demand offerings. Recruiters and hiring managers will need to keep recruitment strategies focused not only attracting skilled talent, but also on creating a positive experience for candidates and marketing their organizations brand. On a similar note, many employers have turned new attention to their diversity and inclusion initiatives as both a retention strategy and a good branding move. It's been said that we're living in a job seekers' market in 2018, and perhaps no area within HR's purview made that more obvious than employee benefits. Flexibility was the name of the game this year. 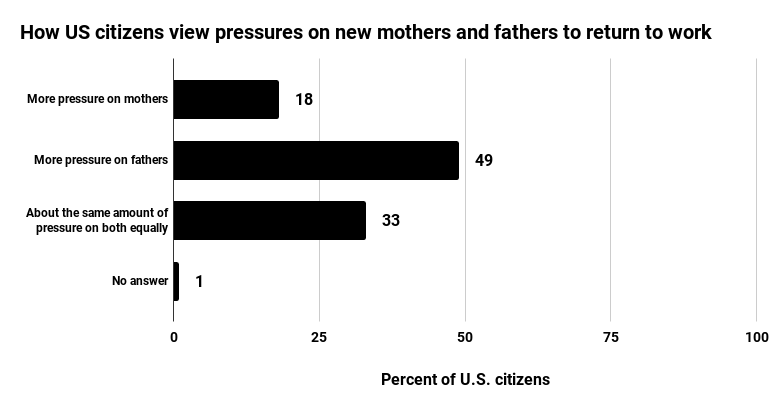 Employers explored and expanded support structures for parents and their families, debuted generous remote-work options, and even state and local governments got in on the action, passing laws guaranteeing predictive (and flexible, in some cases) scheduling. Top benefits stories at HR Dive this year covered updates to newer support areas, like employer student loan repayment contributions, as well as the old standbys: retirement accounts and the ever-steadfast health insurance debate. It wasn't all fun and games, however: a year after a presidential emergency declaration on the opioid crisis, employers and their broker and insurer partners still have much work to do. This diverse series of trends reveals the depth of employee benefits management that lies ahead in 2019. The question, though, is not only whether your organization can afford new perks, programs and purchases, but also whether it can structure them with the right foundation. And as costs continue to rise for fundamental elements of coverage, this may prove an expensive lesson for some HR departments. That all changed earlier this month when the Supreme Court of California decided Alvarado v. Dart Container Corporation of California. The decision transforms the method for calculating overtime under California law when employees receive flat sum bonuses. The court’s decision represents a significant development for employers that pay bonuses and will likely require employers operating in California using flat sum bonuses to revise their pay practices. Under California law, when an individual receives a nondiscretionary bonus, the bonus payment must be included in the employee’s “regular rate of pay” for purposes of calculating overtime. The question in Alvarado was how this calculation should be made with respect to flat sum bonuses. The flat sum bonus at issue was a $15 attendance bonus that employees received when they worked weekend shifts. The California Division of Labor Standards Enforcement (DLSE) has long taken the position that California requires a special, more expensive overtime calculation for flat sum bonuses. According to the DLSE, to protect against dilution as employees work more overtime, flat sum bonuses are to be divided only by straight-time hours and then multiplied by one-and-one-half (or two in the case of double time) to determine overtime premiums on these bonuses. By contrast, the DLSE opined bonuses that increase with more effort or production (for example, a $5 bonus for every 100 widgets made) could instead be divided by all total hours worked and multiplied by one half (or one in the case of double time) to determine the overtime premium owed. Federal law, derived from the Fair Labor Standards Act, does not have any unique formula for flat sum bonuses. And until this ruling, the DLSE’s position on flat sum bonuses was never actually endorsed by a California court. In fact, the court of appeal in Alvarado rejected the DLSE’s position and applied federal law to flat sum bonuses. As a result, many employers relied on federal law to calculate overtime when employees received these bonus payments, using the larger divisor of total hours worked and thus resulting in smaller overtime payments relative to those under the DLSE’s formula. The law has changed. The California Supreme Court unanimously reversed the court of appeal’s ruling and adopted the DLSE’s rule on flat sum bonuses. Although the court did not believe it was bound by the DLSE’s guidance, the court nevertheless found the DLSE’s reasoning persuasive. The court reasoned that using the DLSE formula to calculate overtime on flat sum bonuses furthered California’s public policy of discouraging overtime work. Because flat sum bonuses do not increase with more hours worked, the court concluded that to allow employers to divide by total hours worked in calculating overtime would encourage employers to assign more overtime. In such a case, the more overtime an employer assigned, the larger the divisor would be and the less value the bonus would have relative to each hour worked. The rule adopted by the supreme court requires employers, in calculating overtime when employees receive flat sum bonuses, to divide the bonus only by straight-time (i.e., non-overtime) hours to determine overtime compensation on the bonus. The net arithmetic effect is that the formula adopted by the California Supreme Court results in a payment of more than three times as much overtime compensation on the bonus as the federal law formula. The Alvarado ruling has far-reaching implications for employers that provide bonus or incentive payments in California. For any employer that pays a flat sum bonus, the decision likely means that the employer will need to revise its pay policies immediately to comply with the California Supreme Court’s ruling. At the very least, employers that pay bonuses should consider evaluating their payment policies and calculations to determine if they remain lawful after Alvarado. In addition to policy revisions, the ruling has significant implications for employer wage-and-hour liability. Importantly, the California Supreme Court rejected the argument that its formula should only have prospective effect. Its formula will therefore apply retroactively to flat sum bonus payments. This means that if an employer previously relied on the federal formula, its past flat sum bonus payments were likely unlawful. The effect is not simply that employees who received such bonuses were underpaid. On top of the underpayment, employers could be subject to significant penalties. In addition to unpaid wages, employees in wage-and-hour lawsuits typically seek derivative penalties such as wage statement penalties ($50/$100 per pay period), waiting time penalties (up to 30 days of wages), and civil penalties under the Private Attorneys General Act (PAGA) ($100/$200 per pay period per violation). Given these potential penalties, even a small underpayment could give rise to far-reaching exposure that exponentially increases liability. Moreover, there are many types of flat sum bonuses that are common across industries. They range from attendance bonuses like those at issue in Alvarado to safety bonuses, project-completion bonuses, referral bonuses, job retention bonuses, on-call stipends, and bonuses for earning a degree or technical certification. Therefore, the decision could arguably impact many bonus payments made for a variety of purposes across a broad array of industries. Finally, the ruling will likely lead to significant administrative challenges for employers—an issue that employers may want to consider. Employers that pay flat sum bonuses like an attendance bonus but also make other incentive payments like commissions will have to work with their payroll providers to ensure that two different formulas are applied to the different payments. Since the flat sum rule is unique to California, it will also result in employers with multistate operations having two different calculations for the exact same type of bonus payment, depending on the state. Employers may want to have these conversations with their payroll providers to ensure technical compliance with the law. For employers, there were not many positives to take away from the Alvarado ruling. But, there were a few potentially helpful comments hidden within the supreme court’s ruling. First, the court confirmed prior law finding that informal positions taken by the DLSE in its enforcement manual are effectively “underground regulations” and not subject to deference. Of course, that does not mean the California Supreme Court will refuse to follow DLSE opinions. After all, it adopted the DLSE’s rule in Alvarado. However, this statement is helpful in confirming that the DLSE’s published but informal opinions will not be given binding deference by courts. Second, in a footnote, the court explicitly limited its decision to flat sum bonuses “comparable to the attendance bonus at issue” in the case. The court noted that “other types of nonhourly compensation, such as a production or piecework bonus or a commission, may increase in size in rough proportion to the number of hours worked,” and thus might warrant a different analysis. Therefore, the court did not explicitly extend Alvarado to other types of bonuses but instead left ambiguity as the scope of its decision. Employers may be able to rely on this footnote in distinguishing other bonuses from Dart’s attendance bonus. For example, the Alvarado court reasoned that a flat sum attendance bonus could encourage an employer to assign more overtime, given that the bonus does not increase as more hours are worked. On the other hand, flat sum referral bonuses may be included in the regular rate of pay, depending on the conditions. However, a referral bonus has no conceivable connection to hours worked and certainly does not encourage an employer to assign overtime. Employers may be able to capitalize on these distinctions and narrow the potential scope of the supreme court’s ruling. Only time will tell how this strategy plays out. Third, in a concurring opinion, Chief Justice Cantil-Sakauye noted that the DLSE could have avoided “uncertainty” over the prior law had an interpretative regulation on this subject been promulgated through formal rulemaking. The DLSE’s flat sum bonus interpretation was only present in the agency’s enforcement manual, and because it was not subject to any rulemaking procedure, it had no binding effect. The chief justice characterized this uncertainty as regrettable. Although these words do not change the result of Alvarado, they may prove helpful in defending future litigation based on bonus payments. Certain penalties under California law, like waiting time penalties, require a showing of willfulness. Others, such as civil penalties under PAGA, are subject to reduction in the court’s discretion. Given the uncertainty over the law and the existence of federal law supporting a completely different flat sum bonus calculation, employers may be able to use the concurrence to argue against imposition of these penalties. We suspect that Alvarado will give rise to a flood of litigation in the coming months. As this litigation develops, hopefully courts will shed light on these lingering questions. In the meantime, employers should consider carefully evaluating their bonus payments to ensure compliance with the supreme court’s decision and working with payroll in updating their flat sum bonus formulas. Jesse C. Ferrantella coauthored an amicus brief filed in this case on behalf of California Employment Law Council and Employers Group. President Donald Trump termed the ruling “a big big victory by a highly respected judge” and an alternative path to the long-time Republican goal of repeal-and-replace. The White House said the ruling will be put on hold during an appeals process that’s destined to go all the way to the U.S. Supreme Court, drawing confirmation from Democrats vowing a rapid appeal. It has “no impact to current coverage or coverage in a 2019 plan,” Seema Verma, administrator for the Centers for Medicare and Medicaid Services, said on Twitter. U.S. District Judge Reed O’Connor in Fort Worth agreed with a coalition of Republican states led by Texas that the Affordable Care Act, the signature health-care overhaul by President Barack Obama, needed to be eviscerated after Congress last year zeroed out a key provision — the tax penalty for not complying with the requirement to buy insurance. “Today’s ruling is an assault on 133 million Americans with preexisting conditions, on the 20 million Americans who rely on the ACA’s consumer protections for health care, and on America’s faithful progress toward affordable health care for all Americans,” California Attorney General Xavier Becerra said in a statement. A spokeswoman for Becerra vowed a quick challenge to O’Connor’s ruling. O’Connor was appointed to the federal bench by President George W. Bush. Texas and an alliance of 19 states argued to the judge that they’ve been harmed by an increase in the number of people on state-supported insurance rolls. They claimed that when Congress last year repealed the tax penalty for the so-called individual mandate, it eliminated the U.S. Supreme Court’s rationale for finding the ACA constitutional in 2012. Some health-care law experts were quick to critique the judge’s reasoning and predicted the ruling will be overturned. With just one day left in the sign-up period for 2019 Obamacare coverage, the judge’s ruling is unlikely to have much of an effect on those actively shopping for insurance for next year. As of Dec. 8, 4.1 million people had chosen plans through the federal-government run portal that 39 states use for enrollment. Centene Corp. of St. Louis and California’s Molina Health Inc. are the insurers that would be hurt the most if Friday’s ruling stands, Ana Gupte, health care analyst at Leerink Partners, wrote in an analysis late Friday. Maryland Attorney General Brian Frosh launched a counterattack Sept. 13 to save Obamacare, seeking a judgment that the Affordable Care Act is constitutional and a court order barring the U.S. from taking any action inconsistent with that conclusion. Frosh sued then-U.S. Attorney General Jeff Sessions and the federal departments of Justice and Health and Human Services. The Texas case is Texas v. U.S., 4:18-cv-00167-O, U.S. District Court, Northern District of Texas (Fort Worth). Frosh’s case is State of Maryland v. United States, 1:18-cv-02849, U.S. District Court, District of Maryland (Baltimore). Employers that can't offer bonuses can find other perks that employees might find nearly as valuable. Workers in a West Monroe Partner surveysaid they want flexible work schedules and remote work options during the time-strapped, often stressful holiday season. Respondents said they were just as productive, but less stressed, working remotely than working onsite.